Plenty of produce from the garden now. 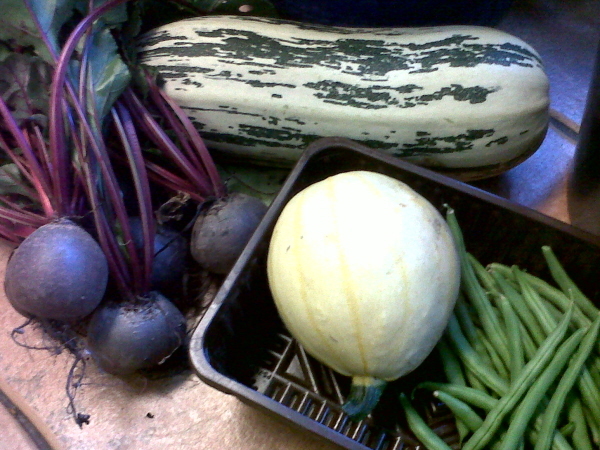 As well as the fruit trees and raspberries the vegetables are producing in abundance - beetroots, marrows / courgettes, squashes, lettuces and three kinds of beans. We keep bean seeds from one year to plant the next. The runner beans have been saved this way for about 30 years when Mum & Dad moved to their Dorset home and bought a new packet. This year I planted 40 runner bean seeds in a new plot (move the bean frame around each year) and nothing happened. After 3 weeks I dug around and found every bean was infested with little white grubs. Checked internet and think they were probably bean fly. (See Which fact sheet for more details - I'll be following some of their advice next year!) Luckily I had some more bean seeds so I planted them in pots to germinate and grow up a little. (We always used to do this, generally to avoid early frosts and get a jump on the weather in cold springs. 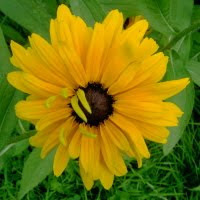 It's only in the last few years we've planted straight in the ground.) 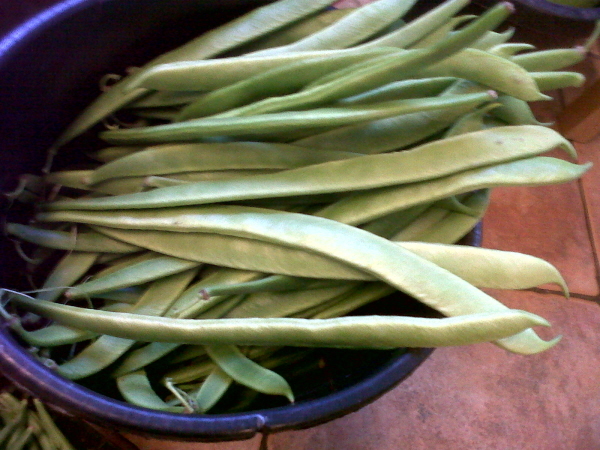 The planted-out beans then got chomped by slugs but the survivors have grown up well and are giving us a bumper crop. French beans have done really well this year. I always plant these in pots in the greenhouse because they are more tender than other beans and are only safely planted out at the end of May. However, the germination rate has been about 50-60% using saved seeds and bought seeds - no difference. After the bean fly experience with the runners I took a close look in the pots and there was some evidence of pest at work, though no visible grubs. Some of the non-germinating seeds and ones with just stubby growth had brown marks on the beans. Haven't yet discovered what causes these. Next year I will plant twice as many as we need. The surviving plants - grown up wigwams of bamboo and hazel - have produced in abundance needing to be harvested every day. Our star performers are the broad beans. In March I planted 30 straight in the ground and 30 in pots with no noticeable difference in germination success, growth rate or productivity. The only problem this year was that they produced beans a plenty during the warm spell and it was difficult to pick and process fast enough. We leave some of the bigger pods to mature and dry off and now I've gathered those and stored the beans in a paper bag ready for next year. 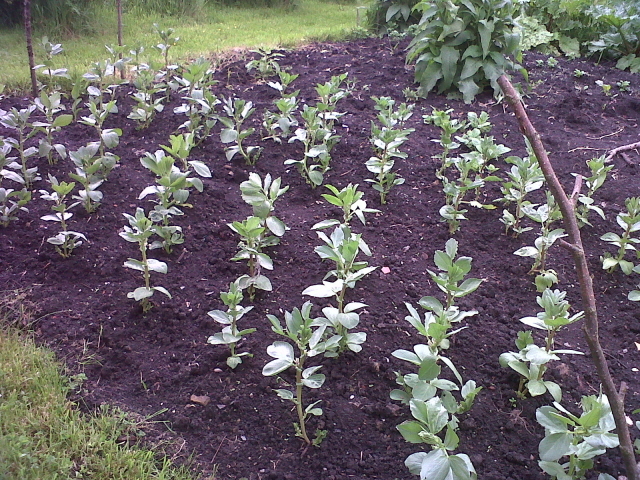 Young broad beans - half grown from seeds planted in the soil and the others in pots and planted out.